The Cisco Catalyst 9500 Series is the first 100 and 40-Gb switch, built for the enterprise campus core and aggregation layer. It was recently recognized as CRN's 2017 Overall Network Product of the Year. Designed for security, on the internet side, and the cloud, Cisco 9500 fixed-core switches are high-density building blocks for a next-generation, intent-based network. 1. The advance Catalyst 9500 switches help to protect your company before, during, and after attacks. This advance technology switches will reduce your attack surface using the trustworthy Cisco system. It will also enhance malware detection and repaid resolution. It has optics for both standalone and Cisco Software-Defined access deployments. 2. 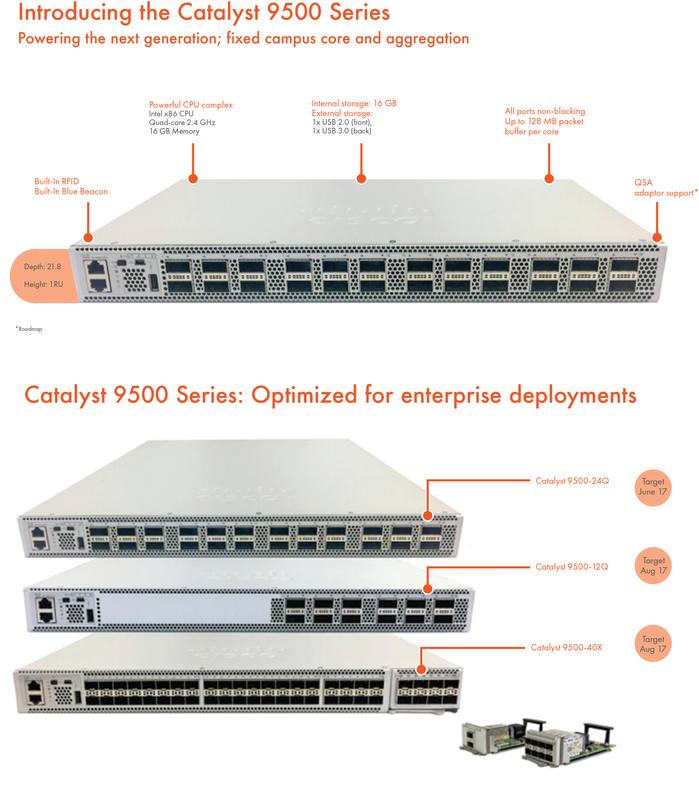 The Cisco Catalyst 9500 Switches are based on the Cisco Unified Access Data Plane (UADP) ASIC architecture. Which protects your investment and you will gain more throughout by using the Cisco Catalyst 9500 switches. 3. The Cisco Catalyst 9500 reduces cost and complexity with Cisco Software-Defined Access by using an automated policy. It will enable fast service and provide complete visibility into the wired and wireless access networks. 4. The Cisco Catalyst 9500 Series also provides 40G, 100G QSFP+, and QSFP28 (which will be in non-blocking mode) The series also provides 1G, 10G, and 25G SFP, SFP+, and SFP28 switches with granular port densities that will fulfill the requirements. 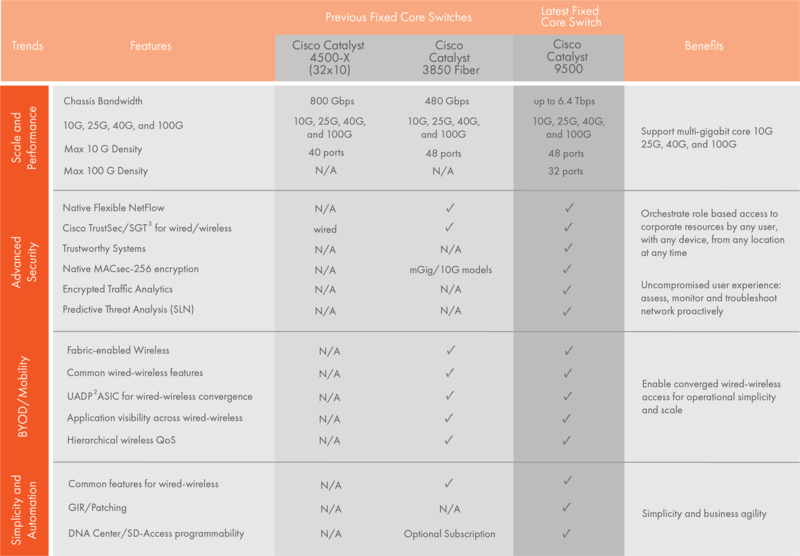 The Cisco Catalyst 9500 series switches portfolio below. The Cisco Catalyst 9300 Series Switches support a 4-port out of 25 Gigabit. These 4 ports are designed as uplink ports. As you can choose any module for your network. It all depends upon your network requirements. The Cisco 25G BASE and SFP28 offers customers a wide range of options including high-density and low-power. Which is connected with 25G and Cisco SFP28 to SFP28 copper direct-attach. 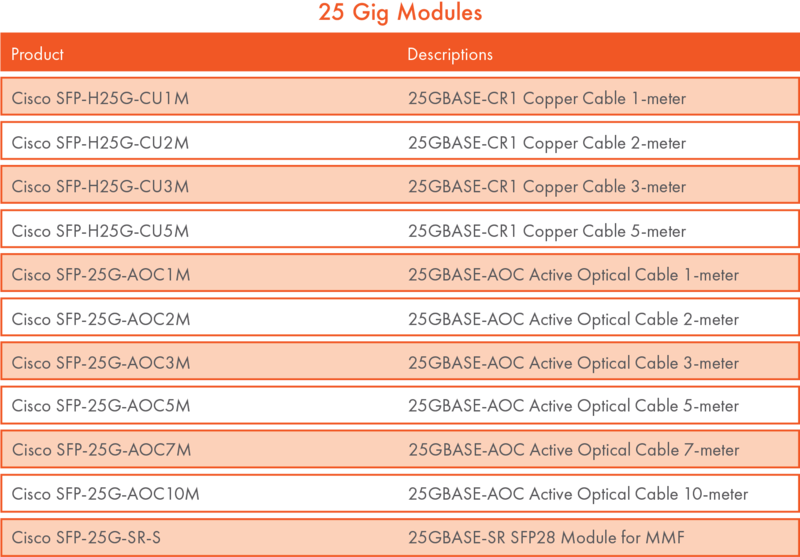 25G BASE-CR1 cables are suitable for very short links and offer a highly cost-effective way to connect a 25-Gb link between the SFP28 ports of Cisco Catalyst 9300 within and across adjacent racks. Support for dual-rate optics in campus and aggregation networks that provide unmatched investment for your organization. Every Cisco SFP-25G-SR-S is compatible with 25G BASE-SR Duplex SFP28. From the brand BlueOptics, their manufacturing is done in accordance with MSA standards. Compatible with other (vendors) IEEE-compliant 25G interfaces. Certified and tested on Cisco SFP28 ports for superior performance, quality, and reliability. High-speed electrical interface compliant with IEEE 802.3. The Cisco 100G BASE CFP2 modules provide customers with 100-Gb Ethernet connectivity options for data center networking, enterprise core aggregation, and service provider transport applications. The Cisco 100G BASE-SR4-S QSFP Module supports link lengths of up to 70m (100m) over OM3 (OM4) Multimode Fiber with MPO connectors. It primarily enables high-bandwidth 100G optical links over a 12-fiber-parallel, and are terminated with MPO multifiber connectors. 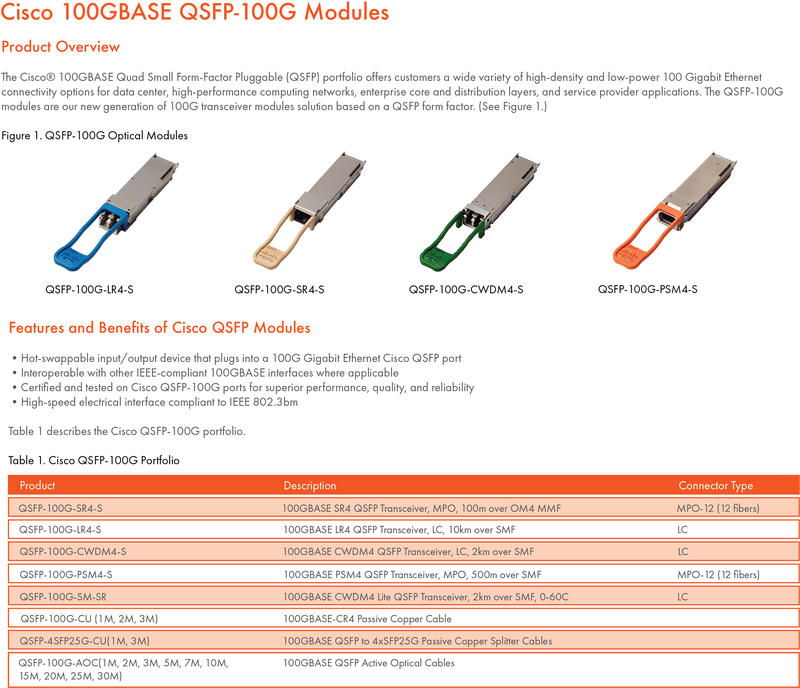 QSFP-100G-SR4-S supports 100G Base Ethernet rate. In the table, you can check the 100G BASE module and specifications.